I hope you are inspired by the scenes in my images as much as I am awed when taking them. And thank you for viewing my photography; there would be little incentive for me to take photos without others appreciating them. 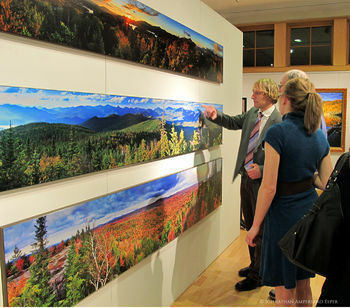 Landscapes images are most impressive as physical photographic prints, as their large format and photographic detail brings out a realism and sense of being there yourself that no computer monitor can convey. 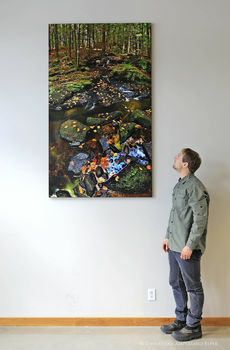 On a wall, prints also act as escape from the present to the natural world we call wilderness. We are all deeply connected to the environment in which we live, and I hope my photos and large- format prints can connect you ever more strongly. The culmination of my artistic vision is offering you print and mounting options, which I detail below. All images on this site are also available for stock image licensing, and I offer photography workshops, and assignment photography services. 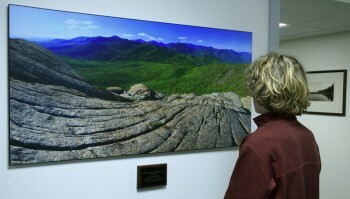 Wildernesscapes Photography features images of unique landscapes, in unique, custom dimensions that differ for each photograph, unconstrained by standard proportions. When I mentally compose a picture out in the wilderness, I don't limit the scene I wish to show you, based on standard print sizes, or even camera sensor dimensions. I don't compose my images through the viewfinder; rather, I compose the scene through my eyes, and seek to capture that through my camera. 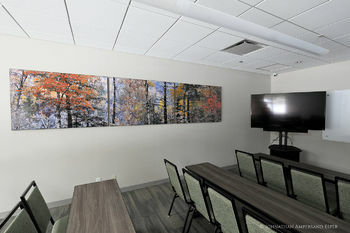 This is why many of my images are actually composites of multiple exposures stitched and blended together, with the added benefit of creating ultra-high resolution images capable of large-format printing - to 16 ft. (5m) long with photo quality, in some cases. (Zoom into the photo here to get an idea of the photographic quality and detail you can expect in all my prints.) 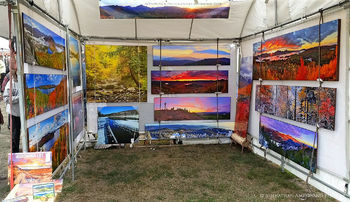 So, listed below a gallery photo, the photo sizes available for ordering are for the long side of the photograph; the other shorter dimension floats proportionately. I print and mount all my photos in the same exact custom proportions that you see on your screen, without any cropping of the image. You may purchase archival-quality photographic prints and ready-to-hang mounted prints, directly from the page on which each photo is seen. You will be redirected to a secure Paypal credit card processor for payment, once you've selected your options. Custom size prints other than the sizes shown are possible; please contact me for pricing. Prints are professionally printed with archival papers and inks, with a satin finish. Prints are archival with a rated lifetime of 150 years under ideal conditions. On special request I can also print on canvas, for a photographic canvas gallery wrap mounting option. I can print up to 40" x 96" dimensions. Digital printing today is highly advanced and technical, so I rely on professional photo labs that know how to create beautiful prints instead of printing my own, so I can focus on taking photos. I can ship print-only orders world-wide. While domestic shipping within the United States is free, I will charge you the actual shipping costs incurred when shipping to other countries using United States Priority Mail International. I will bill you for these added shipping charges after you place your order. Smaller prints are typically mailed flat, while larger ones are rolled in a large tube. Print orders typically take 1 week for processing, but may take longer if I am in the wilderness. Client Quotes may be read here. For mounted prints, I use an frameless archival mounting process commonly called “plak” mounting, an alternative to traditional picture framing. An archival-quality paper print is dry mounted onto a high quality HDF wood fiberboard, and then sealed under heat and pressure with an UV protective satin finish lamination. The final result is a non–glare, easy to clean, professional looking product at half the cost of traditional custom framing. The laminated pieces are UV, water, and fingerprint resistant, can be wiped down with a damp cloth, and are easily transportable, sturdy, and highly resistant to scratching. The UV resistant lamination virtually eliminates glare, making this a great mounting choice when displayed in areas lit by natural sunshine or bright lights, where traditional glass framed prints would be difficult to see through all the reflections. The piece hangs flush against the wall. 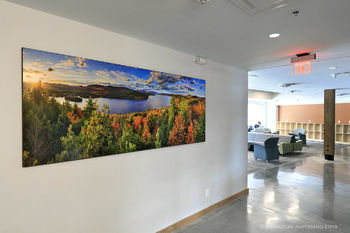 This great in high-use areas like hallways, where you won't accidently snag the image when walking by. Yet another advantage of this mounting method is the photos themselves seem to pop out and became real, like you are actually standing in the scene, and not just looking at a photo of it. I think it's because there is no distracting frame; it's as if you are looking out a window in the wall to a real scene. The 3/8” or 1” thick edges (depending on photo size) are descreetly finished with a slight beveled edge in a choice of several matching colors. 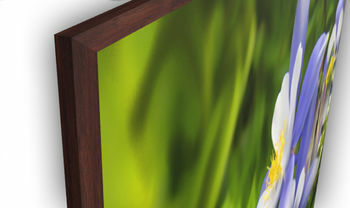 Additional plak-mounting process details: The composite wood boards are manufactured with sustainable materials and are made from 100% recycled wood fiber. The composite cores contain formaldehyde-free adhesive systems. They are then treated with a smooth high pressure laminate both front and back. This offers an acid free mounting surface serrated from the wood core. The edge finishes are furniture-grade colors and are the highest quality on the market. All of the surface finishes are acid free and non-yellowing and they contain UV inhibiters. While these pieces are very lightweight and sturdy for their respective sizes, please exercise care when handling and storing your piece, so that they don't overly flex due to careless carrying or storage positions. I can ship these plak- mounted prints to many areas of the world. Shipping within the United States is a nominal $10-$40 depending on size; for international orders, I will charge you the actual cost of shipping, less the shipping charges automatically added in the website checkout page, in the form of an invoice sent to you around the time your photo is delivered. Please contact me prior to purchasing for a shipping quote estimate if you so desire. Mounted orders typically take 3-4 weeks for processing, but may take longer if I am in the wilderness. I do not offer traditional custom framing options, due to logistical and shipping practicalites. If you do buy just a print, I highly recommend you get your print archivally framed in a custom frame shop in your area. Because my photos are usually in non-standard dimensions, you will not be able to buy a pre-made frame for your print from a larger store. I am happy to drop-ship the print directly to a local custom frame shop of your choosing, if you so request. I am confident you'll be mesmerized by the scene in your photo, and photographic detail and quality with meet your highest expectations. However, I understand there's always an element of the unknown when ordering through the internet, and there's nothing like being able to see and hold for yourself a real physical piece of art. So, if you are not satisfied by the quality or appearance of your photo after receiving it, I will gladly refund you, less any round trip shipping charges, if you contact me and return your piece within 10 days of receiving it, in it's original condition and packaging. Please be careful when unpacking your photo, so you don't crink a photo, or scratch a mounted print on the boxing staples, and carry and transport your piece with care and proper support; I cannot refund you for damages you incur to your piece. You may be interest in reading the Client Quotes page. 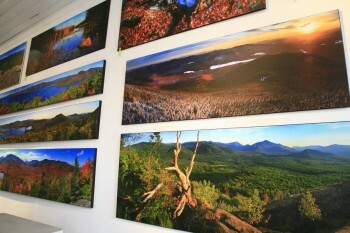 My large, fine-art photos are in extremely limited editions of only 46 prints, recalling the 46 Adirondack High Peaks where I first discovered nature. All my photos are discreetly signed on the front, and are numbered, titled and signed on the back. I do this to add value and personalization to your piece, as I will substantially increase the price of a photo as it nears its limited edition cap. Sometimes my signature will come in the form of an electronic embedded signature, descreetly added to a lower corner of the photograph before printing, and other times I will hand sign my photograph. This is because I work exclusively digitally, and often drop-ship orders to clients directly from the photo lab, in which case I don't personally handle a physical piece and get to sign it. My fine art prices are well below the average charged by photographers, and not routing orders through me and then re-shipping them is one way I can reduce costs and pass these savings onto you. Please understand also, that I consider myself a large-format photographer, so stock uses of my imagery, commercial uses (except for fine-art wall display), greeting cards, and most small prints up to 24" in the longer dimension, or many panoramic photos less than 60" long (basically, if the photographic detail inherent in my digital file cannot be appreciated at the requested smaller size), do not count as part of my limited editions. 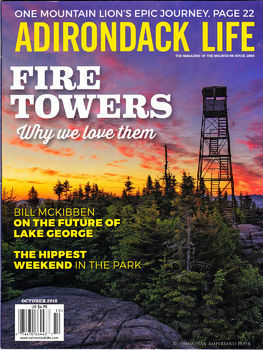 I also offer an exclusive Treetop Series comprising my images I've taken from the tops of trees I climb and photograph from, revealing unique canopy-level views over the Adirondack region. This series is also in limited editions of 46, and carries a 10% price premium to reflect the unique angles captured, and the physical challenge and danger of capturing these photos in the air. Wildernesscapes Photography content is available as stock photography or stock video, through rights-managed licencing. Pricing is generally less than full-stock industry standards. Many additional stock images of wilderness landscapes and adventure and outdoor lifestyle are on this site that are not visible in the photo galleries. 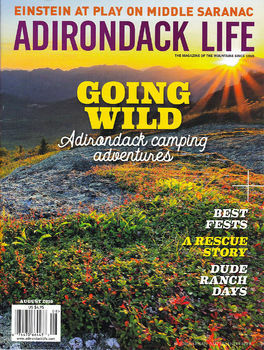 A search field at the bottom of the page provides you targeted keyword-based search of all some Adirondack images. However, if a search fails to turn up anything, just contact us as very likely we have images of your desired location but haven't put them on this website for public search. 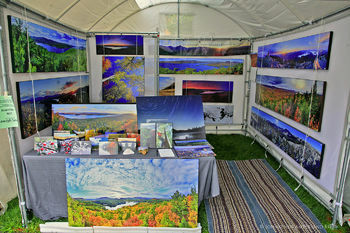 If interested in licensing any images as stock, please contact Johnathan Esper through the Contact page. At most times, you will receive a reply within a couple days; however, Wildernesscapes Photography does not have full time office staff, so Johnathan Esper appreciates your understanding and patience, especially if he is out in the wilderness. Email is checked periodically, however, and usually Wildernesscapes Photography is able to upload images to meet requests, even if Johnathan is personally out-of-country for an extended period. Johnathan Esper's photography has been licensed for use in commercial and governmental websites, world-wide organization calenders, textbooks, and leading outdoor gear retailers. Prints of his photography are being enjoyed by health-care centers and many private individuals in their homes and places of business. 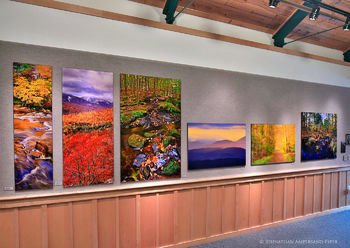 Johnathan Esper is available for interior panoramic, outdoor, and wilderness commission photography that will represent an excellent value to you. I always return with a plethora of images, regardless of the conditions, and I wild camp and keep costs close to zero when in rural and wilderness areas. (I have even bought and sold cars locally instead of renting to reduce costs on previous long-term foreign trips). In many cases, I'll consider a majority of my travel expenses to be personal, reducing your cost further. My daily rates begin at $300 USD/day. Please contact me to discuss your particular image needs. Upcoming trips include New Zealand and Tasmania hiking, Mt Logan Yukon Canada mountaineering expedition, and Iceland trips annually every winter and summer. I offer quantity discounts on prints and mounted-print orders of 3 or more pieces, for both private homes and offices and places of business. Please contact me directly so we can work out the details. 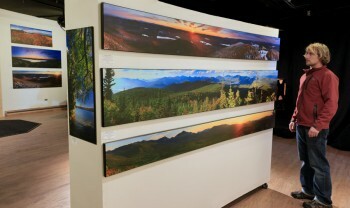 A collection of my beautiful large- format prints can bring to life a room better than any interior decoration. I also extend significant discounts to environmental charities and organizations needing stock images or fine art, and I am available for photo assignments on environmental issues at a discounted rate. I also offer existing customers a lifetime discount of 10% off all orders; if you already have a peice of mine, contact me for details on how to redeem your discount. I also lead adventure photography tours and workshops in the Adirondack Park and internationally around Iceland (full details and trip schedule at workshops page). I also offer private photographic instruction and tours to individuals or private groups, in the field; I self-taught myself from the beginning to where I am today, so I understand the struggles photographers face. Contact me so we can talk about your individual situation; I typically charge $250/day for individuals and $400/day for private groups. Speaking engagements: I can speak and give photographic presentations at your next event, on a variety of unusual or motivating topics such as 'Treetop Photography' or 'Every Photographer's Dream: Selling'. I have spoken at previous public events from camera clubs to non profit organizations, with positive feedback.